A mortgage loan exists between two parties: it comes from the bank to the person who buys the home. The mortgage document fully describes all details, terms and conditions of the loan. It explains the principal balance amount, the expected maturity date, interest rate information, and the terms by which the owner can pay down the debt. The deed of trust is a special type of encumbrance on the title of the home. It too sets forth the details and terms of the mortgage loan. But unlike the mortgage document, the deed of trust designates a trustee (often the title company), who actually holds a form of ownership in the home until the loan is fully repaid. Yes: the buyer is still considered the homeowner. Yet the deed of trust represents a conditional transfer of ownership to the lender. In this way, the trustee is positioned to start a foreclosure on the lender’s behalf in the event of the buyer’s default. This non-judicial foreclosure is cheaper and simpler for the lender. The lending institution can simply reclaim the property from the trustee, exert its right to the title, and thereby avoid what would have been drawn-out judicial foreclosure proceedings against a title holder in default. Once recorded, the mortgage or deed of trust will appear on the title to the home. This is the county’s public notice that the lender has a lien on your home. It is now time for the lender to release the lien. Within 3 weeks after you fully pay your loan off in California, for example, state law requires the lender to cancel the deed of trust and dismiss the trustee. The lender does this by issuing a deed of reconveyance. Another term for this, in the mortgage situation, is the deed of release of mortgage. 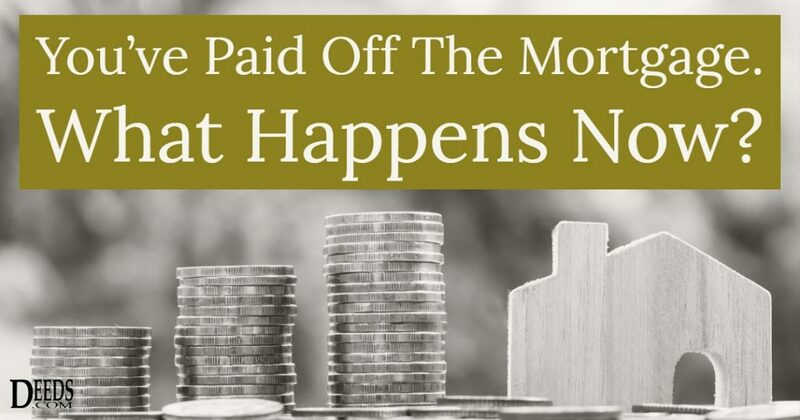 It shows that the homeowner has paid for the property, fully satisfying the conditions of the loan. In Georgia, to take another example, the lender releases the mortgage by returning the original security deed—the cancellation stamped on its face—or a quitclaim deed specifying release or cancellation. You may get a payment from the lender, returning reserve funds that were held in escrow for property taxes and the homeowner’s insurance. When the bank no longer has a lien on your home, you own it. Be sure you have the documentation to prove it in a safe place—such as an actual safe. Get in touch with the county treasurer’s office. It should have your up-to-date details. Be ready to pay the property taxes that used to be paid from your escrow account. Contact your insurance provider, too. Be sure the agency removes the lender from your homeowner’s insurance policy. And do be sure you are carrying title insurance for your home. Whatever the rate you paid on the loan, you are now saving. That’s a good thing. Pay off the mortgage, and you can also take out a reverse mortgage to help fund a happy retirement. Life after your mortgage is paid does have its perks.